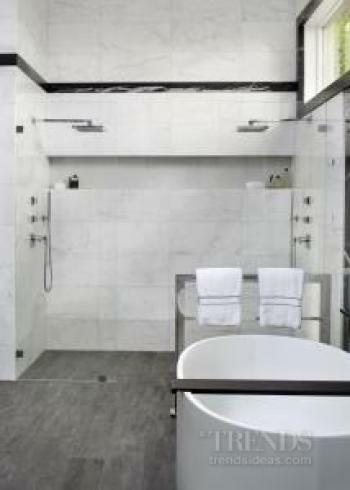 Several design constraints helped shape this high-end bathroom by designer Leslie Lamarre of TRG Architecture + Interior Design. 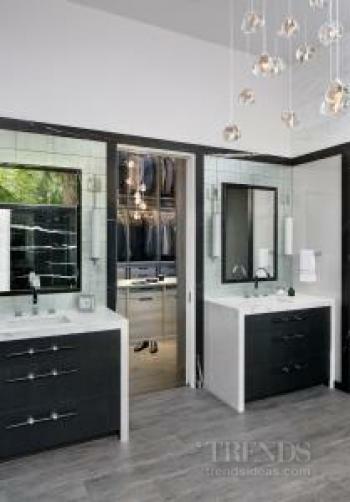 "Our brief for this project was to transform a chaotic bathroom and wardrobe space into a contemporary, luxurious and masculine master bathroom for a high-powered executive couple. 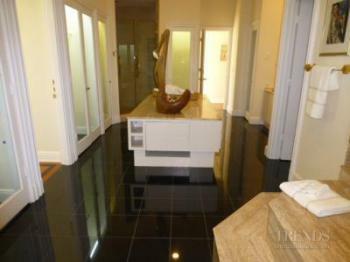 "The owners requested an expansive closet space – enough room for at least 200 pairs of shoes – and a black and white colour scheme. Design challenges for Lamarre included working with the unusually tall 3.65m ceiling height and retaining the existing window with its view of a redwood grove – this was the only natural light source in the room. At the same time, the modern look had to work well with the home's traditional architecture. 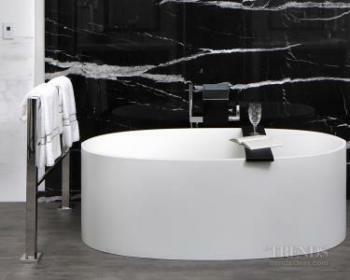 In response, the design team introduced a dramatic black marble slab to anchor the space and backdrop its focal-point – the free-standing tub. The slab continues up to the lofty ceiling, visually connecting it to the floor. In contrast, a quiet white marble covers the wet walls. "While used in a modern form, the black and white marbles are classic materials that fit well with the home's architecture," Lamarre says. 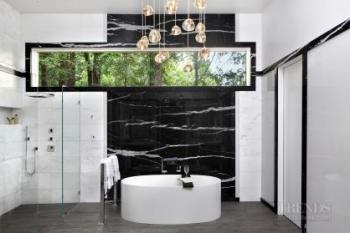 Rather than lowering the high ceilings, the designer used the horizontal line offered by 2.5m-high doors to create a visual line around the room in the same black marble seen behind the tub. This approach brings the sense of the ceiling height down to scale while retaining the spacious feel. 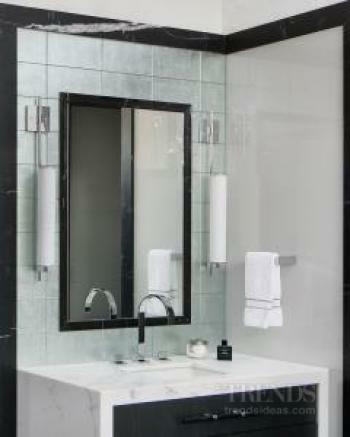 The same black marble was also used for the custom frames on the fog-free mirrors over the vanities. Lamarre sectioned off nearly half the space to accommodate a walk-in closet, incorporating a redundant linen closet in the adjacent hallway. The existing master closet was converted into a seasonal closet, contributing to the overall amount of closet space required. Matching the height of the doors and marble slab, tall panels of white back-painted glass add to the list of rich materials. This glass treatment is repeated as backing in the shower soap niche, and again as a frame for the feature slab. Silver-backed glass tiles behind the vanities add to the sense of luxury while the cascading crystal chandelier mimics rainfall and creates a sense of tranquility. 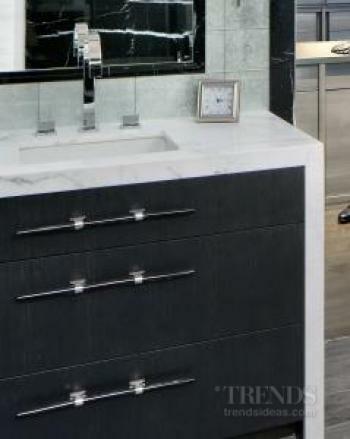 Textured porcelain planked flooring, heated for comfort, completes the welcoming bathroom.